COS, a London-based contemporary fashion brand, is collaborating with French architect, Arthur Mamou-Mani, to create a 3D printed bioplastic installation to be displayed during Milan Design Week at the international furniture trade show, Salone Del Mobile. This form will also include interactive elements that provide “contrast between the permanence of the palazzo’s marble and stone and the impermanence of the bioplastic,” added Mamou-Mani. Arthur Mamou-Mani working on the design for the 3D printed installation. Photo via COS. Founded in 2007, COS or Collection Of Style specializes in modern, functional, apparel for women, men, and children. For eight consecutive years, COS has been present at Salone del Mobile, collaborating with an array of designers, including Sou Fujimoto, Nendo and, Snarkitecture, to construct a series of installations. Last year, COS became interested in Mamou-Mani, following his creation of a giant 3D printed mandala for the Galaxia temple, installed at Burning Man. 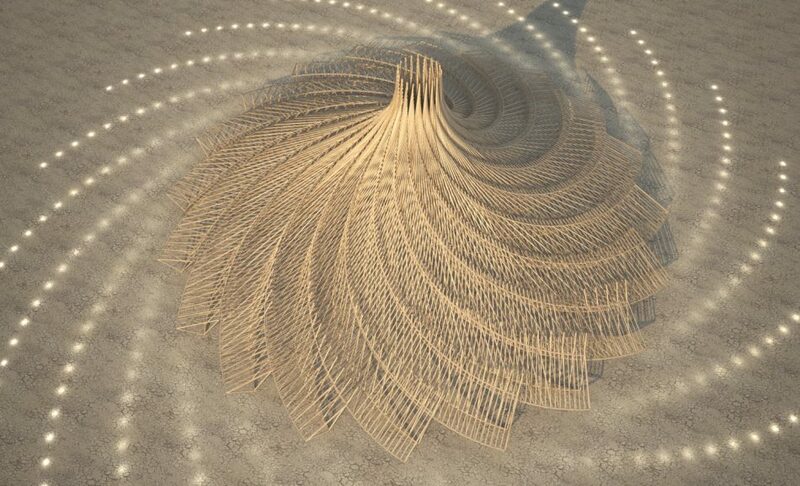 With experience in parametric design and digital fabrication, Mamou-Mani created the gyrating structure from 20 timber trusses rising inside the 3D printed mandala. The temple was built as a sanctuary for the event-goers to “pray, heal and release grief.” According to Mamou-Mani, the temple is designed to help one reflect on such emotions. The Galaxia Temple for Burning Man 2018. Image via Mamou-Mani. For this year’s Salone del Mobile, COS intends to focus less on aesthetics and more on environmentally friendly installations. “There is an awareness of materials that is starting to come back in architecture,” Mamou-Mani stated to Architectural Digest. The pavilion in development from COS and Mamou-Mani will also be constructed using on-site 3D printing to reduce transportation pollution and material wastage. This concept has been applied for humanitarian projects currently nominated for the upcoming 2019 3D Printing Industry Awards. The Salone del Mobile will commence on April 9th until the 14th. Don’t forget to make your in choice for the 2019 3D Printing Industry Awards before the deadline. For more on additive manufacturing, subscribe to the 3D Printing Industry Newsletter, follow us on Twitter, and like us on Facebook. Searching for new talent. or looking for an AM career move? Search and post 3D Printing Jobs for opportunities and new talent across engineering, marketing, sales and more. Featured image shows the 3D printed bioplastic modules of the Salone Del Mobile pavilion. Photo via COS.